Here's an Easy-to-Make Breakfast-in-Bed Recipe for Mother's Day. Smoothies are the perfect way to give your kids the important nutrients they need - like calcium, fiber, and vitamins - all blended up into a sweet, slurp-able package. Celebrate a WILD Earth Day with Mother Earth and friends across the globe. The idea of using food to improve personal health has fueled consumer interest in less processed, authentic food and has spurred the surge in food trends like organic, GMO-free, paleo, and all-natural. Wild Blueberries May Help Fight Alzheimer’s Disease - see this exciting, new research. Research presented at the 251st National Meeting & Exposition of the American Chemical Society (ACS), the world’s largest scientific society, revealed that blueberries could help prevent the devastating effects of Alzheimer’s disease. 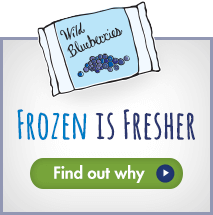 Make your own fruit roll-ups with all natural wild blueberries. Recognizing a need to educate American consumers, food manufacturers and food-service providers about the value of indigenous foods, the Wild Blueberry Association of North America is bringing together food-industry thought leaders, elite chefs, research experts and health influencers for a six-course dinner called “Eat on the Wild Side” February 2 at the Green Table in New York City.